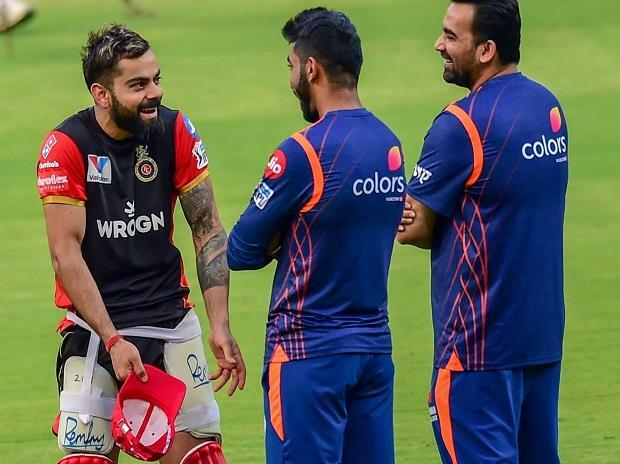 In the Match 7 of VIVO Indian Premier League 2019 (IPL 2019), Mumbai Indians (MI) would fancy their chances against an erratic Royal Challengers Bangalore (RCB) when the two star-studded teams square off at M Chinnaswamy Stadium in Bengaluru on Thursday. Virat Kohli's RCB, who are yet to win IPL title and regularly draw a lot of flak for that, were bundled out for 70, the sixth-lowest score in IPL history, in their first game of IPL 2019 against Chennai Super Kings. The injury of Jasprit Bumrah has given the sleepless night to India and Mumbai Indians a sleepless night after he injured his shoulder during the last ball of the Delhi Capitals innings. However, according to various media reports, he is fit as it was just a case of shoulder spasm. But it would be interesting to see whether Mumbai Indians team management will pick him in their playing 11 or give him more time to become match fit. Lasith Malinga is likely to be available for the next two Mumbai Indians IPL matches after Sri Lanka Cricket (SLC) softened its stance on the participation of the veteran pacer in a domestic ODI tournament. SLC had earlier announced that only those players would be eligible for selection in the ICC World Cup 2019 squad, who would compete in Super Provincial One-Day domestic tournament, slated from April 4 to 11. The diktat had forced Malinga to make himself unavailable for Mumbai Indians' first six matches." Later, SLC Chief selector Ashantha de Mel said that Mlinga's place in the World Cup bound squad is guaranteed, so he is free to participate in the IPL. We have no issues if he goes to IPL - the board had given him a no-objection certificate already, so he's free to go. Anyway he has been one of our best bowlers in one dayers, so there's no question about his place in the team," Mel said, reports news agency PTI. RCB will expect its batsmen to put up a formidable total after they were bundled out for a paltry 70 in 17.1 overs against the Chennai Super Kings in the opening match of the season. With power-hitters like Kohli, AB de Villiers and Shimron Heymeyer in the team, that should not be an uphill task. Leg-spinner Yuzvendra Chahal will again be the key man in the RCB bowling attack and will need the support of the other bowlers. RCB vs MI match live streaming will be available live on Star Sports 1 HD, Star Sports 1 in English Commentary and Star Gold in Hindi Commentary. One can also live stream the RCB vs MI match on Hotstar app and website.